Highland Country Club junior Colin Warren has lofty goals: he wants to graduate from a university golf program, then join the PGA Tour and win the Masters Tournament, just like his golf hero, Mike Weir. Warren, 18, has competed on the Junior Tyson Tour – Canada’s oldest junior loop (est. 1968) – for seven years. A member of the highly-successful Oakridge Oaks golf squad, Warren won the Tyson Tour’s Les Thomas Memorial Tournament July 24-25 with a two-day total of 146 (+6). He posted a score of 72 (+2) at Thames Valley Golf Club, followed by a 74 (+4) at Fanshawe Golf Club, beating fellow Junior Boys competitor Jake Bedard by four strokes. Overall winner Colin Warren of Highland Country Club. Photo: LondonOntarioGolf.com. This is the 50th season for the Tyson Tour, and the 37th year for the Les Thomas event (est. 1981). The two-day tourney carries the name of the former Golf Ontario director and commissioner of London’s Public Utilities Commission in the 1970s who was a big backer of junior golf. Weir, playing out of Huron Oaks Golf Club in Bright’s Grove, captured back-to-back Les Thomas trophies in 1986 and ’87. Still coming to grips with the fact he had won the tournament, Warren smiled from ear to ear, learning that his name would be etched on the same trophy as the 2003 Masters Tournament winner and member of the Canadian Golf Hall of Fame. “It’s pretty cool, now that I’ll see my name on the same trophy as Weir. But I’d love to see my name on another trophy with him, at the Masters. Maybe one day,” Warren said. Just as junior golf participation struggles on a global scale, Tyson Tour enrollment is at a crossroads, too. 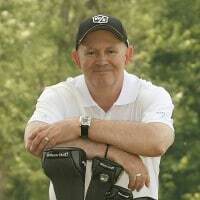 Overall, the Tour is highly-organized, with local PGA of Canada pros, including Tour convenor Steve Bennett of City of London golf courses, overseeing operations. And despite the fact the Les Thomas field had declined to 54 golfers this year (including just three in the Girls division), Juvenile Boys and Bantam Boys divisions remain very strong. 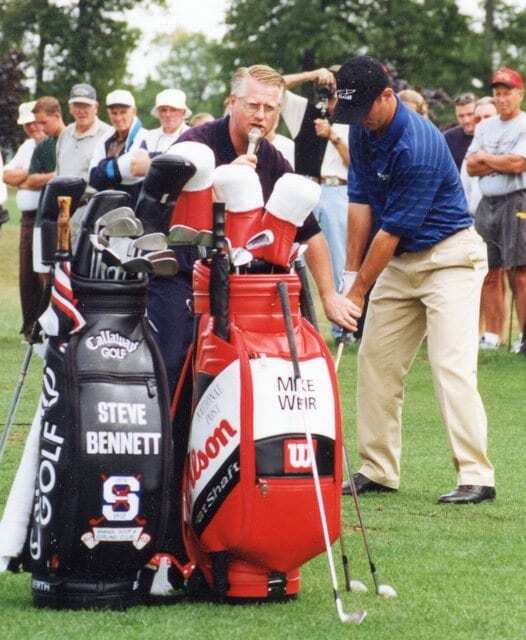 Steve Bennett with Mike Weir at Huron Oaks, shortly after Weir’s first PGA Tour win in 1999. Photo: Jeffrey Reed. This year for the first time, all girls compete in one division as to combat dropping enrollment and to ensure a stronger bracket. In addition, a new points system was implemented this year, outlined at the Tour website, juniortysontour.com. And for a second straight year, a Pee Wee division offers youngsters a taste of tournament golf. “The Pee Wee division is for those kids who really haven’t played competitive golf, but are thinking of playing competitive golf. So we reached out to them. And maybe down the road they’ll venture into playing the 18-hole events,” Bennett said. The Tyson Tour has helped launched numerous golf careers. Weir went on to win his first national title at the 1986 Canadian Juvenile Golf Championship, then won the 1988 Ontario Junior title before Ontario Amateur titles in 1990 and ’92. A 2017 schedule of 11 one-day events, plus the two-day Les Thomas tourney, ends August 30 at the invitation-only Sunningdale Tour Championship, where prizes and bursaries will once again be awarded to winners. Other winners at the Les Thomas tournament included: Jake Bedard, Junior Boys; Aidan Smith, Juvenile Boys; Brent Schidowka, Bantam Boys; and Girls division winner Jillian Friyia. Click here to see more photos from yesterday’s final round at Fanshawe.